Have you ever wondered what it would be like to sell your home and ride half way around the world? Well that's exactly what this homesick pommie couple did. In February 2011 Will & Kate set off on their motorbikes from Wollongong in Australia heading for Woolwich in south east London. In 5 months they covered about 21,000 km across 20 countries. They crossed the emptiness of the great Aussie outback and then negotiated the manic traffic of Bangkok, Kathmandu and Delhi. Next came the fabled and dangerous Karakoram Highway through the mountains of Pakistan, up and over the 4600 metre Khunjerab pass and into China. More rough roads through Kyrgyzstan and Kazakhstan led them to Russia, through Ukraine and then the final 5,000 km push through Europe. The authors prove that with a little planning and a sense of adventure anyone can do it. If you've ever dreamt of doing a great overland ride like this, then this book is for you. 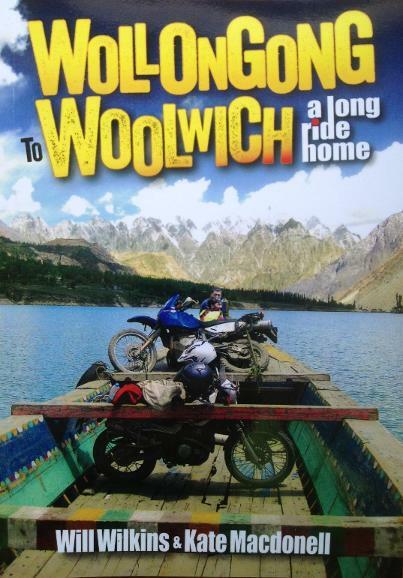 It not only tells the story of their long ride home but also includes an A-Z of information and tips on how to plan and prepare for a motorcycle adventure. Be warned though, reading it may inspire you to get on your bike and before you know it you'll be saddled up and heading off into the big wide yonder. Caution: Reading this book could lead you anywhere!!! These guys are already off down to the shops, keen to get their hands on a copy of the book! They should have just used the 'Buy the book' tab at the top of this page to avoid disappointment!